While experimenting with and fine-tuning my talk to small groups about my e-book, The Worthy Organization, I discovered that while in any group of people there are a few who really want to know about how my book will help them inspire a cadre of volunteers and need this book — most people are more interested in hearing about the process of publishing online. It seems that almost everyone has a book they’d like to write, or knows someone with a good idea for a book. In response to this interest, I have developed a short talk (20-minute or less) talk about e-publishing your book. I would be happy to present it to your group, in person or online. Your feedback will help me fine-tune the talk. No obstacles, no excuses — not any more! Booksellers and specialty niche markets – which is right for you? The extraordinary fundraiser, Harvey McKinnon, has just published an article that answers the questions that are most often posed when he gives talks. Harvey’s experience in the field of fundraising is vast, and his advice is always valuable. 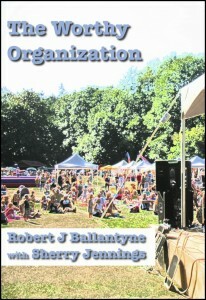 I know you will enjoy the article, Fundraising Questions I’m Most Often Asked. << click this link to read Harvey’s article at the Guidestar site. Harvey guided our fundraising when we worked together to save the Vancouver Island marmot from extinction. 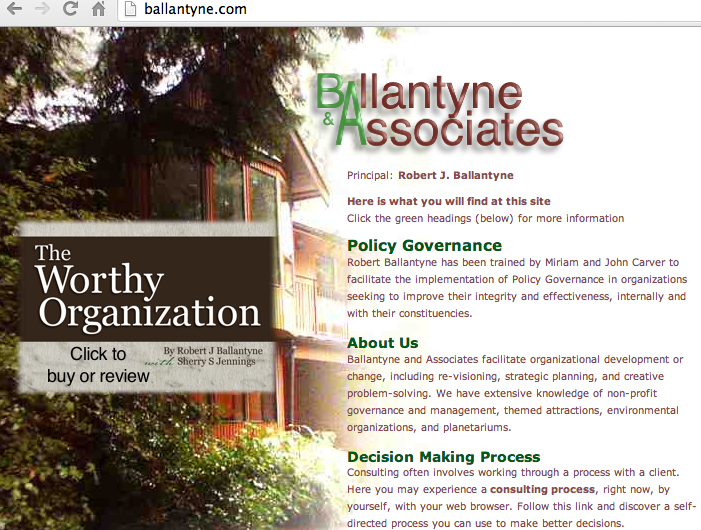 I (Robert) just added a clickable button on the home page of Ballantyne.com that is a link to The Worthy Organization’s page at Leanpub. I’ve been creating web pages with WordPress so often lately that I’d forgotten how to position a linked graphic with CSS (a cascading style sheet). Today we decided that The Worthy Organization was ready for purchase online. It will soon be at the landing page for the book and on this banner for this site. This material is created by Morgan Collier, a wonderful designer, and — as brides around Edmonton, Alberta, are discovering — an accomplished wedding photographer: Morgan Darcy Photography. 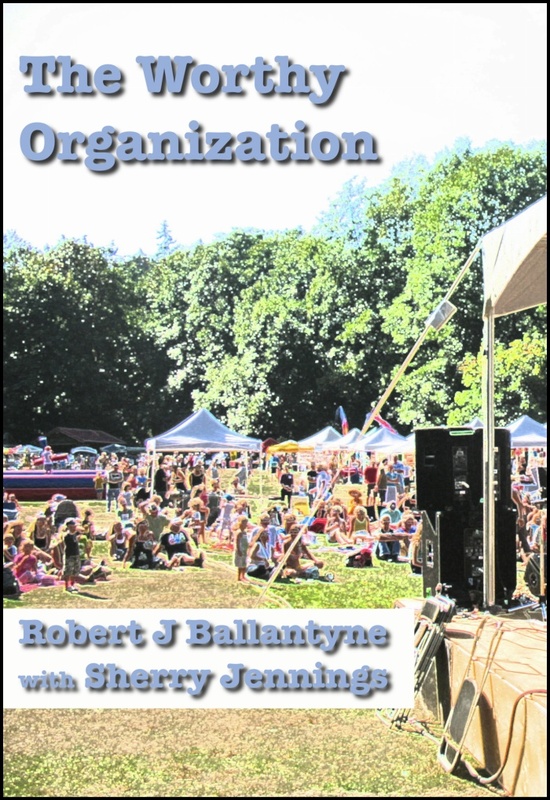 When I (Robert) created the landing page at Leanpub.com for the draft of The Worthy Organization, I realized that a book needs a cover page. So, one afternoon I created this book cover from an image I had on my computer. The original was a snapshot taken during the annual late-summer festival on Bowen Island, Bowfest. Sometime this week I will replace that with the real cover for the book. Does anyone ever read the first post at a blog? I (Robert) do. When I find that I’m enjoying the articles at someone’s blog, I’ll go back to the very beginning to see what dreams and ideas prompted the author to set up the blog. Often the style changes as the blogger experiments with the process. Well, here I am at the first post of a new blog. It is now in the last days May of 2014. 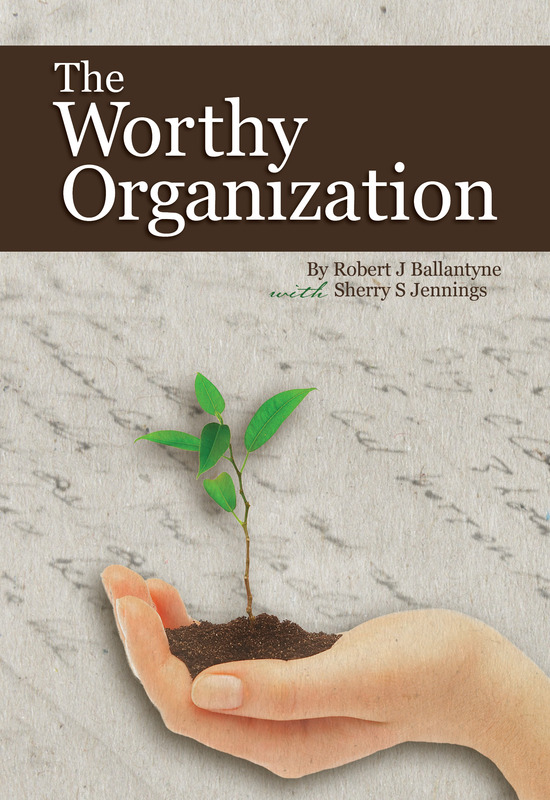 We are making the final adjustments to the book, The Worthy Organization, and I hope that we are now only days away from making it available for sale online. One of the items on my todo list was to buy this domain, and set up a web site. That’s what I’m doing right now. If you know how to navigate a blog, you might discover that there are articles at the blog that were posted before the date of the first blog article. Those were experiments in time-travel. I’ll leave you to go there and explore how that is possible — if you are interested.